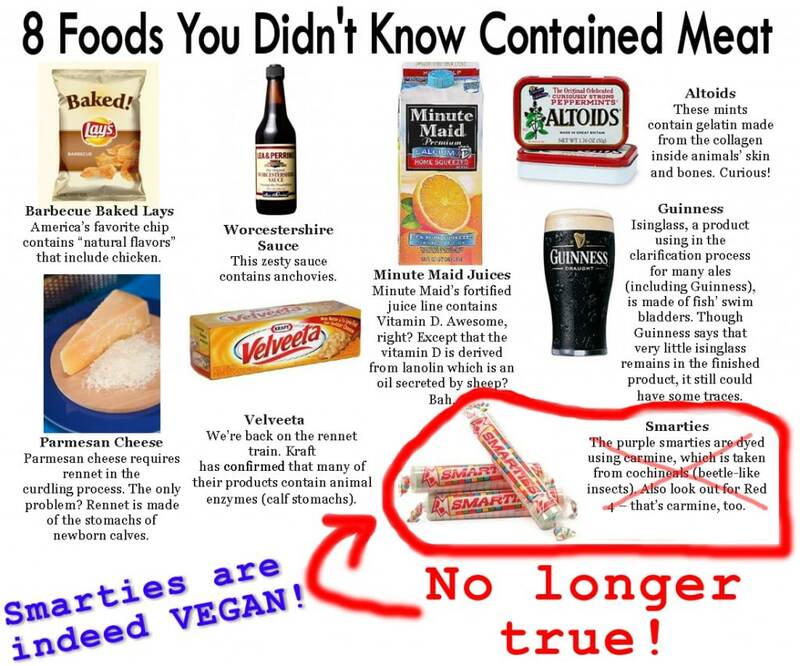 In our inaugural episode (May 1, 2012) we mentioned a list of 8 products that are secretly not vegan. As it turns out, one of those items (Smarties) are INDEED vegan! You have an article on your site that states that Smarties are indeed Vegan. Is this true? Has this changed? Please be assured that our Smarties products are vegan and do not contain any animal products or by products. The information that is listed on the link that you included in your email, regarding Smarties containing carmine, is false. We appreciate you brining this to our attention, thank you! We hope that this has addressed your concern. If you have any further questions please feel free to contact us. There you have it! Smarties are vegan! Please circulate this UPDATED version of the graphic we posted in Episode 1 so that we can help spread the truth! Thank heavens because my kid eats them and I eat a few sometimes.